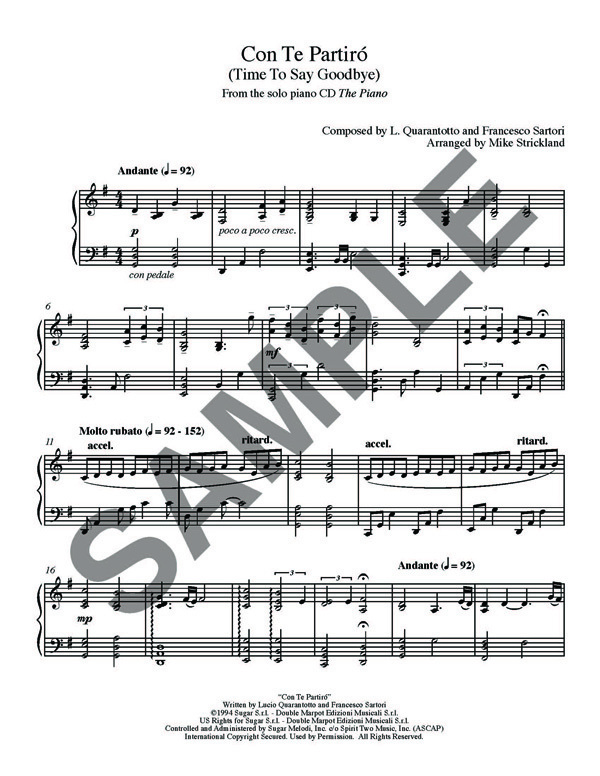 This sheet music, available in hard copy only, is the exact transcription of Mike’s beautiful arrangement from his CD The Piano. This is the instrumental version of the Italian song famously performed by Andrea Bocelli. Beautifully rendered and printed in 9 X 12 booklet form. Only available on this site. “About a week ago, I ordered the sheet music “Time to Say Goodbye” from your online store. Being that I order online, I was expecting my order to be processed and shipped in a very mechanical process. When I received the package, I was delighted to see handwritten memos and a complimentary piece of music. I purchase a lot of sheet music online, this order made me feel much, much more like a valued customer than any other store. I want to transfer my personal thanks and appreciation for your customer service. I love Mike’s music, and I’m very grateful for the extra steps taken to make me feel valued! Thank you and I will definitely be a repeat customer!